1. It is simply not reasonable to assume that a bolt or any fixed piece or even a removable piece of gear is fail safe. 2. Two ropes are safer than one. As usual the message got corrupted and the theme of the forum hijacked by various contributors with the main issue being raised as to how irresponsible the climbers were who bolted the route. Not only that, but that may or should or could be held criminally liable. 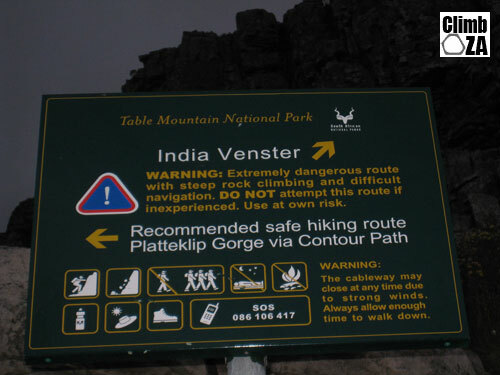 The India Venster route on Table Mountain is public property. As such we, the public, are responsible for what happens to it and on it. The Table Mountain National Park are merely the curators or guardians of it. Every year several people get seriously injured and deaths are not infrequent. In our technology driven world a Google search does bring up some warning signs but someone doing cursory research can easily find themselves on the very well constructed steps leading up to the contour path as it is logical to start at the Cableway station. This then naturally leads up on to the trail. 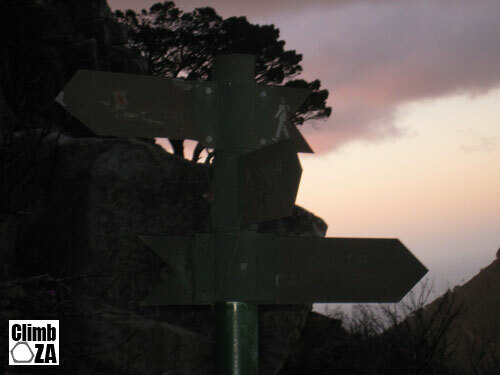 Until I, yesterday and today, posted a description of the trail on Wikipedia and the Climb.co.za wiki section there has been no online description of the route and where its problems lie. At no national park in the whole of South Africa where equivalent dangers lurk would there be such unregulated access e.g. Game Parks where you are not allowed to even walk around freely or leave your car. Yet India Venster and TM in general probably causes more trauma and even death than all the sharks and wild animals in the whole of South Africa. One can consider this at least as irresponsible as the bolters involved in the Australian tragedy. The whole safety problem on India Venster can be dramatically improved by a variety of methods which is a debate on its own and his been brought up before to some extent. I think is is an imperative! Last edited by SNORT on Thu Feb 05, 2009 5:45 pm, edited 1 time in total. I climbed India Venster about a year ago. It is a great hike and should be treated with some respect. However, I notcied at the time that while at the bottom, the path is very clear and easy to follow, the next half is not as clear. For tourists or those new to the route, there are yellow painted footsteps that also show the way. However, as you need them most, i.e. the last quarter, they practically disappeared! These sorts of things need to be maintained and are a definite safety feature in my opinion. Strider: Yes indeed the yellow footprints are faded. The path was recently rehabilitated but it still does not make a difference to the difficulty of the Grade C (US 4th class) scramble where so many accidents occur. In December a Norwegian hiker fell and died there and an experienced local climber/hiker sustained a fracture spine. These accidents can be relatively easily avoided by a number of means. Although it would be controversial just one or two metal hand rungs would go a long way to prevent accidents. As undesirable as this sounds, it is difficult to justify not having an aid like this at the scramble. And I think it is the lesser evil than regulating access to the trail which would be expensive and onerous to enforce. But clearly something needs to be done. Restricting access with a manned gate (manned by someone who speaks the languages of all the tourists? ), is possible but very difficult. How do you prove that you are "capable" of acending the path? It cannot be an issue of experience, as we have rescued very experienced people who have fallen on the scrambles. If it is an equipment issue then what do you do if they are under equipped? Send them up Platteklip? They are still underequipped for hiking. Or do you turn them around, deny them access to the mountain? Protecting the scrambles would probably reduce the number of injuries but this is by no means a complete solution as they will still continue to injure themselves on various other parts of the route. I do agree that the upper sections could be better marked though. I for one would not be adverse to a couple of steel rung type holds at the beginning and end of the difficult section. I have come really close to slipping here a few times especially in the heat of afternoons when my hands are sweating. I also lost the path on the final lead up to Africa Ledge recently after a long absence from the hill and I have been up there dozens of times. So for tourists I reckon losing the path and getting into difficulty must very easy. Nic, thanks for the info. Yes the Mountain at large including Platteklip does get more victims than India Venster and even Mount Everest (the one in the Himalaya) but intuitively users of Platteklip are not at particular danger except if they are physically really incompetent or compromised. It is infinitely more forgiving as a way up the mountain and down it. Intuitively there is no way that users can 'read' the objective dangers of going up India Venster. And serious inrjuries and death, at least on a per capita basis are rare on Platteklip and more importantly, rare from plummeting due to the effects of gravity. I have rescued a Danish dude that had scrambled way up on upper Africa Ledge to the right of Africa Gullet. He was a competent scrambler! And intuitively he knew this and thought the sign at the start encompassed this! This is not likely to ever occur on Platteklip where rescues are invariably related to out of condition people succumbing to weather and other conditions. A better comparison is the Kloof Corner route which intuitively, because of the chains and he exposure, is more scary; and it rarely results in accidents. If you read my contribution to Wikipedia, I make the point that the scramble on India Venster is not intimidating and that's what makes it dangerous. From the bottom is does not look exposed. And one is more than 1/2 way up before being faced with the dilemma of the scramble. Kloof Corner is inherently safer and easier because of the chains but much scarier and that's what makes it safer. I contend that it is too onerous to regulate access to the route but a much greater effort must be made to divert people from attempting it. It can start by removing those lovely built steps at the very start and forcing people, say without an access card, -local climbers and the like -even a Wild Card - to start at Platteklip. If you start at Platteklip you, intuitively, ain't gonna come across to go up India Venster. There should also be sign there that indicates that the steps only lead to the contour and not India Venster. No warning of danger is sufficient. There are lots of simple, cheap and easy ways of dealing with this. All I know that as an "owner" i.e, (citizen of SA) of India Venster who is held financially liable for the accidents that occur (I pay over 50% of what I earn in VAT and tax) this situation has to improve! How did the chains and hand holds on various parts of the path up Lions Head get to be there? There are even handholds in areas that are a lot less of a problem than the "C" section of India Venster. Nic, are there regular accidents at the chains on Lions Head? I think that section would be harder without chains than India Venster. In my opinion SS hand grips like on the Lions Head path would be ideal. So steel rungs & chipped hand holds on an foot path are OK, but bolts & chiping on a route are not. TM is a complicated place. Have you guys thought about positions in government? There should be one standard. Marshall1 wrote: Have you guys thought about positions in government? As long as the SS rungs are ARF spec, it's all good I supopse? As for a single standard: around the world and on TM, the Berg and elsewhere assistive metal devices are standard on trails. Don't confuse a very specific trad ethic that may or may not apply to TM (and on which there is no consensus or standard) with a public trail/path that regularly injures and kills people and that the owners, (that's us SA taxpayers) have to pick up the tab for. They are different issues. I contend though that, as with the fixed pro principles that I subscribe to to make a route safe, this same principle should be applied here. i.e. "The simplest, most aesthetic and least damaging and most permanent alteration should be made to the trail to make it safe. " Fixed metal holds have the same problems as bolts and need replacing every 20 or 30 years. Cutting, building more positive hand-holds is an option but may still not be positive enough and is very damaging. Engineering the trail will change its character but the whole trail is actually engineered except the scramble. So as distasteful as it is to me, metal rung holds would seem to be the simplest option! Metal rungs are the way I reckon, the boulder that blocked the exit at the top of the scramble has already been trundled off. Its going to save time and money on rescues. Many years ago while we were climbing, a girl slipped going down the scramble, fell on her head, bounced and went down to the bottom!! I've also had some close calls on that scramble. Rungs are probably the simplest, safest option I reckon - proper route marking should also be made I reckon... otherwise rescue teams might as well just camp on the mountain while the Soccer World Cup is on. @SNORT - I'm not really complaining, pulling your leg a bit. I think you'll do tons better in parliament than 75% of them put together. Not that is really saying much....., no offense! I think this is going to be another one of those looooong drawn out topics..
Make the place safer - more people come, more people = more risk of accidents even though the percentage of incidents may have declined. Leave it as is, less people, a higher percentage of incidents per number of visitors. A question: (and please forgive me my ignorance - I don't know the mountain) Will this not perhaps set a precedent for setting up more walks / scrambles by making it "safe enough" and thereby further contributing to the current set of problems? For once i agree with Snort. I have often thought while going up India Venster that a SS rung/ladder (ala LH) in one or two sections would make it safer for all going up and down on those sketchier sections. Come Snort, get the ball rolling please ! TM National Park is 1 park. Same rules should apply to whole park. Why should it be OK to use fixed steel to cater for casule tourists, yet scream blue murder when an climber (enthusiast) wants to do the same? "Make the place safer" shows that you are responsible for it & can take responsibility for it & could be liable. I think the trick to avoid liability is to avoid charging, & show no ability to take resposibility or control. Who can hold CNC responsible for an area they cannot control. Who can be responsible in a general free for all. The MCSA needs to avoid making the mistake of becoming a body that can be held responsible. I hear what you say Emile about making it 'easier' to go up the mountain, however its on the tick list of things to do for many tourists (who view the mountain from almost anywhere while in the Cape Town CBD). It is also one of the most recommended things for tourists to do (and there is no charge to do it)!! Throw in a world cup with more tourists flocking to Cape Town and that's going to be a lot of people on the mountain! Any lawyers around to comment on who is responsible if such actions were to be taken?? if i remeber correctly the sign at the bottom of india venster says that the route involves "rock climbing" - not scrambling - and yet tourists and locals alike stream up the trail. i've done it only 4 times and 2 out of the 4 saw somebody falling from the steep scramble - both people in their 60s and one a seemingly fit hiker (the other a lady who should not be up there in any event); both seriously injured. methinks chains / holds or something on the steepest part is a neccesity - and a very good point about 2010 justin. SNORT wrote: All I know that as an "owner" i.e, (citizen of SA) of India Venster who is held financially liable for the accidents that occur (I pay over 50% of what I earn in VAT and tax) this situation has to improve! SNORT, don't worry about those rescues emptying gawerment's coffers, they do that very successfully on their own. I'm with Derek - if you do it, or organise it being done, you open yourself up to liability. Kind of like bolting a route. Emile :Making it safer won't increase traffic at all. It is the position of the start of the route at the main hub. that makes it so compelling. Platteklip is remote and not obvious. One can see the steps and they say "come hither" And at the contour the path says - "go up there"!! If it is easy or difficult it is by far the most intuitive way to go for the un-informed. My problem is that, by default, the taxpayer is liable and we kak and betaal for every rescue. No rescue and medical treatment is ever paid for in full by the injured party. I do a lot of legal opinions for the RAF and let me tell you the tax payer foots an enormous bill for the drunkeness, recklessness, stupidity of drivers on the road. And my argument is that the present status quo on the Indai Venster trail is akin to recklessness and stupidity given where it is, not what it is. There is an in "your face" trail but the real and present danger of it is not "in your face" when you embark on the trail. Justin: Thanks for the pic of the sign. It is misleading as it states that if you have experience then you can do it. Many experienced individuals - even those familiar with the trail - have fallen on it. It should also perhaps state that it should not be attempted without a guide or if one has never done it before. And it should state actually that it is extremely dangerous even for experienced hiker/climbers: because it is!. There is not a move on Arrow final that is as hard as on-sighting this thing! Margaret my wife is extremely "experienced" including having done Routes at Blouberg, Klein Winterhoek frontal and led up to 19 trad. She is not comfortable doing the scramble on her own! As I have said in my previous posts "There is always one idiot"
Take any easy access to anywhere and tell people the risks and they will still take it as it is shorter/easier than going the safe way. Novices at anything have no way of appreciating the severity of the danger. On TM I have watched people in thier sunday best with a 500ml bottle of valpre in each hand attempt the mountain at miday in december. "Idiots"
and its not just table mountain - take the chain ladder on the sentinal inn the drakensberg and thats 2500-3000m in height and I have watched people do the same as above. "But its only 4km, it wont take long, and there is a ladder"
The only real way to control saftey on the mountain is to police it. Have rangers physically escorting people off the mountain if they appear to be "Idiots"
As for putting handholds on the mountain, why not just build a path with bridges and seats for resting and water fountains, hell even a kiosk. OK I am ranting, sorry!. My point is people have got to start taking responsiblity for thier own lives, we shouldt have to baby them. I hear you and argue with the statement: "Never argue with idiot, they'll bring you down to their level and beat you with experience"
The person(s) policing the mountain will have to argue with would be walkers and have the say of who does and who doesn't get to go up the mountain - its unfortunately not going to work (think of the young dumb / old and wise who will be able to tell you better). Adrian20971 said: As for putting handholds on the mountain, why not just build a path with bridges and seats for resting and water fountains, hell even a kiosk. There is already a cable car to the top however people have been told how wonderful it is to walk up the mountain and most of them are very determined to do this! I still believe metal rungs on the scramble and better route markings is the best option to make the route safer. The 'onsight' aspect is where the damger lies, if you know the hidden handholds and odd trick its not too bad but still scary and dangerous. Someone should just sneak up there one night and install a few stainless steel rungs. If no-one knows who equipped it then no-one is liable when a touron falls off the steel rungs themselves! The other alternative is to glue on rocks as was done on Lions head, they wont rust and will last as long as the epoxy holding them, however this may not produce a positive enough grip for older people or overweight tourists. Justin you are correct. Rungs and info are the simplest, cheapest and safest things to do. To aver that people must take responsibility for their own stupidity is not good enough. I am not really interested in the individual that does something stupid. All accidents come at a human and financial cost to many other people and to the tax payer. Nobody wins. It so much better to avoid accidents by any means possible. and then see if anyone of the ARF bunch will go glue in some decent rails. If I remember correctly the ladder in Echo Valley was installed to aid the Hoerekwagga guides in doing their work. If they can break their own regulations to ease their path then there is precedent for us to do the same! It'll make getting up to the Ledge a lot safer. Statistically how many times can you do this scramble (esp coming down in the afternoon heat) before you will slip? All the members of WSAR with the exception of the METRO personnel are volunteers and don't charge for their time on rescues (We are now allowed to claim petrol if we drive more than 100km). The METRO personnel are who participate in rescues are on duty and are payed as such. Therefore no costs attach to rescues except where a helicopter is used. So for approximetely 70% (helicopters are used in ~30%) of all rescues there is NO cost to anyone. So your taxes are safe for the government to throw away on other things. Personally, and I admit that I am biased, I cannot actually think of a better use of my taxes than saving lives. I cannot remember who asked but yes there are accidients on LH at the chains but fewer than on India Venster. you can check out the stats for yourself at http://alewis.its.uct.ac.za/sama/. Since 1835: Lions head has had 60 rescues of which 11 were deaths, 39 injured and 10 were uninjured. while India Venster has had a 100 rescues of which 6 were dead, 20 were injured, and 74 uninjured. It would seem that it is not the scrambles but rather the lack of route marking higher up on India Venster that are to blame for the majority of rescues on India Venster. Nic, the cost to society, friiends and family is not just the financial cost of the rescue. There are the treatment costs too. And that's where it really costs the tax payer. Even if you have a medical aid, it means that as a mutual cross subsidized insurance system, your medical aid rates will go up. The fact that you choose to volunteer is a cost to you, your family and society too. You could be doing something else if a fall was prevented! The costs of trauma to society is so huge that in state hospitals and in the private sector it is given priority one status. Commonly called emergencies. And the best way of dealing with the problem is prevention. And this is what this discussion should be about. How best to prevent the problem which is limited to that one little scramble on India Venster.